Skilled malpractice trial attorneys serving Washington, D.C.
Of all the malpractice errors, wrongful amputation is perhaps the most serious and the most unforgiveable. When a healthcare provider’s negligence leads to the needless loss of your limb, you have every right to be angry, frustrated and depressed. You may also feel overwhelmed by your new position in life: How can you provide for your family? How can you handle the medical expenses? Paulson & Nace, PLLC, can help alleviate some of the stresses of your new life by fighting for justice on your behalf. For more than 40 years, we have helped medical malpractice victims in Washington, D.C. who lost a body part because of a surgical mistake, an administrative error or a provider’s negligent behavior. We have secured millions of dollars in compensation for families who needed it most, and we want to hear your story. At Paulson & Nace, we understand that there is a difference between a necessary amputation and a wrongful amputation, and we are prepared and qualified to tell you which category your case falls under within the law. We also know that time is of the essence in cases such as these. The medical expenses incurred from an amputation surgery, along with the cost of rehabilitation, prosthetics, changes to your home such as installing ramps or safety bars, medication and the loss of income can devastate your family and your future. Our skilled team of trial attorneys works quickly and efficiently to move your case along so that you can begin the process of rebuilding your new life as soon as possible. We refuse to settle these types of catastrophic cases for less than our clients deserve, and will fight aggressively on your behalf in a jury trial if we believe it is necessary to do so, to obtain the compensation you need. We know there is no price you can put on walking or the ability to hug your children. That is why we continue to stand up to insurance companies and hospital administrators whose profit margins are more important to them than their patients’ needs and futures. With Paulson & Nace by your side, you are never alone. The statutes of limitations for medical malpractice cases in Washington, D.C. are brief; your relationship with us will not be. 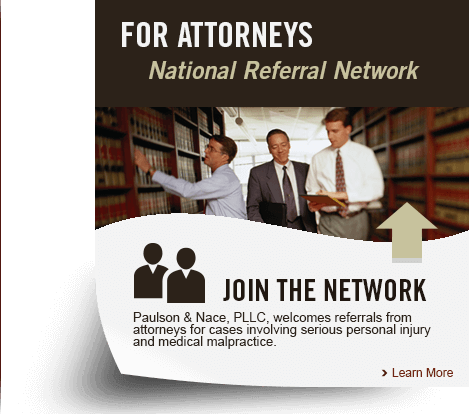 Paulson & Nace, PLLC, wants to help. Please call 202-930-0292 or fill out our contact form if you were grievously injured by a wrongful amputation.